Writer and director Joston Theney wrote in with the official cast listing for his upcoming indie slasher flick The Axeman at Cutter’s Creek. Read on to see who’s who and who will be chopped to pieces! 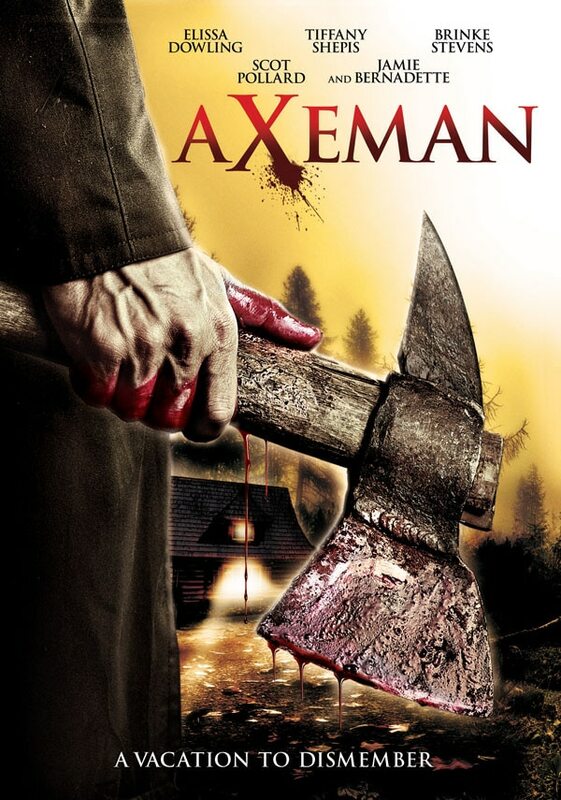 THE AXEMAN (Scot Pollard) – The title character who may or may not be the local legend that terrorizes the town every few years and vanishes into the forest without a trace. PAULIE (Ray Trickitt) – A career criminal recently released after serving 10 years at Folsom State Prison and looking for a big score. CASSIDY (Chantelle Albers) – Former collegiate track star and estranged friend of Stacy who finds herself in a love triangle with Stacy’s new beau and her current beau, Doug. STACY (Elissa Dowling) – Former collegiate track star and Cassidy’s estranged friend who finds herself at odds with the childhood friend she’s always known and loved. DENISE (Tiffany Shepis) – A career criminal looking for a large enough score to walk away from the dangerous life she’s chosen. VALE (Carlos Javier Castillo) – Childhood friend of Paulie’s from “around the block” that master-minded their new heist but realizes Paulie may be a liability. SHERIFF CHARLENE WOPUZER (Brinke Stevens) – Small town Sheriff that knows all-too-well the legend of the Axeman at Cutter’s Creek and patrols the area like clockwork to protect her townspeople. DEPUTY DARLENE WHITFIELD (Arielle Brachfeld) – The party girl daughter of Mayor Whitfield who doesn’t take her job seriously in the least. TAMMY (Jamie Bernadette) – Long time friend of Doug and Randy who finds herself in a new relationship with a woman she’s longed to be with since college, Liz. LIZ (ERIN MARIE HOGAN) – Long time friend of Stacy and Vivian that finds herself in her first lesbian relationship with Tammy and wrestles with what that means to herself and the group. VIVIAN (Eliza Kiss) – Liz and Stacy’s best friend and fiery, vain princess who is far too accustomed to the wandering eyes of men and loves to torture those that pursue her. ADELE (Paula Tracey Wilson) – Deputy Darlene’s retired school teacher that moonlights as the front desk administrator at the Sheriff’s office. BRIAN (Stephen Eith) – Stacy’s current beau, who finds himself caught in the middle of a love triangle between moving forward with her or rekindling the flame with Cassidy. DOUG (Dylan Hobbs) – Cassidy’s current jock beau, who is acutely aware of Cassidy’s wandering heart and struggles to find what it takes to keep the relationship healthy while refraining from beating Brian to a pulp. RANDY (J. Scott) – The jokester of the group that has only remained close with Darren over the years and finds himself the last of the them holding on to his youth. MAURICE (Dave Hernandez) – Local tour guide who reluctantly takes the group up the mountain to Cutter’s Creek, knowing what ultimately awaits them as the sun sets. He debates whether to stay or leave them to their own devices. DARREN (Joston Theney) – As close friend of Randy and current admirer of Vivian, he seems to be the only member of the group that has moved forward with his life as an adult willingly but still carries a torch for the girl of his dreams. ‘AXEMAN AT CUTTER’S CREEK’ stars Elissa Dowling (BLACK DAHLIA), Tiffany Shepis (NIGHTMARE MAN), Brinke Stevens (SKELETON KEY), Ray Trickitt (LORD OF THE RINGS: TWO TOWERS) and Arielle Brachfeld (THE HAUNTING AT WHALEY HOUSE). Rounding out the cast are Chantelle Albers, Jamie Bernadette, ERIN MARIE HOGAN, Eliza Kiss, Dylan Hobbs, Stephen Eith, J. Scott, Carlos Javier Castillo, Paula Tracey Wilson, Dave Hernandez and NBA superstar Scot Pollard as the Axeman. Get the axe in the comments section below!